Our physical and digital identities intersect in a million ways in today's world. Sharing and gathering information with partners and third-party vendors to streamline business processes while keeping the information secure and genuine is challenging. Last year was big for blockchain technology. Among its many use cases, blockchain unlocks opportunities to leverage its trust, distribution, and immutability to publish identity information among various entities while maintaining a clear cryptographic ledger. Sensitive information goes through a strict approval process and is encrypted to be accessed only by specific parties. Blockchain core concepts are out of scope for this blog post. If you wish to learn more about blockchains, please refer to the resources section at the end of this blog. 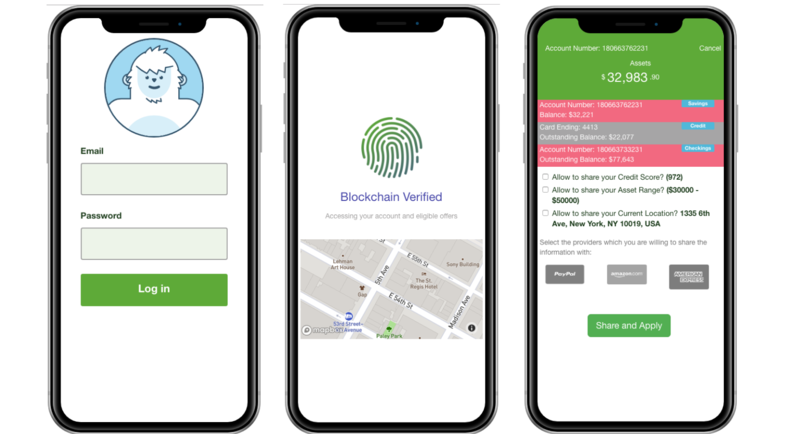 As a proof of concept, we built a blockchain identity management application. We used the blockchain structure and concepts to save and publish digital identities for a fictional bank network. Using NodeJS we have built a network of nodes which are run by the various partners in the network, pushing and governing the production of blocks within the chain. Figure 2. Identity information is published to the blockchain. Figure 3. Nodes on the blockchain network approve the information/encryption signatures. Other approved parties can consume the information once it is approved. The main idea is that data can be pushed to the blockchain network by Bank A (Figure 2), consumed and approved by the majority of the network, and appear as trusted information for Bank B or C (Figure 3). Whether the information is encrypted or in the clear depends on Entity A. Using this information, Banks B and C can push offers and promotions for those customers based on the blockchain network information without the need for a centralized registration authority. That’s a wrap for Part 1 of this blog series. In Part 2 we’ll cover the implementation details and key takeaways. 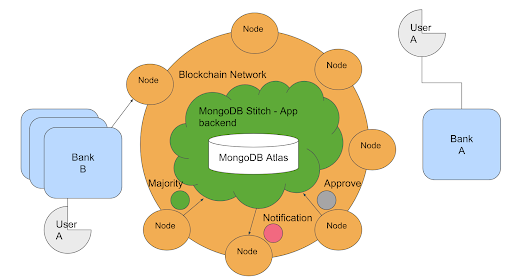 Learn how we built a distributed identity management application on blockchain using the MongoDB Stitch serverless platform and MongoDB Atlas cloud database service for a financial services use case.